George Gilfillan (January 30, 1813 – August 13, 1878), a Scottish author. He is now remembered as the subject of An Address to the Rev. 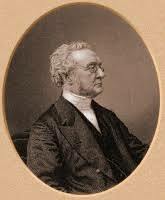 George Gilfillan, the first of William McGonagall's poetic productions. He was one of the spasmodic poets. He was born at Comrie, Perthshire, where his father, the Rev. Samuel Gilfillan, the author of some theological works, was for many years minister of a Secession congregation. After an education at the University of Glasgow, in March 1836 he was ordained pastor of a Secession congregation in Dundee. He published a volume of his discourses in 1839, and shortly afterwards another sermon on Hades, which brought him under the scrutiny of his co-presbyters, and was ultimately withdrawn from circulation. Gilfillan next contributed a series of sketches of celebrated contemporary authors to the Dumfries Herald, then edited by Thomas Aird; these, with several new ones, formed his first Gallery of Literary Portraits, which appeared in 1846 and had a wide circulation. It was quickly followed by a Second and a Third Gallery. In 1851 his most successful work, the Bards of the Bible, appeared. His aim was that it should be a poem on the Bible and it was far more rhapsodical than critical. His Martyrs and Heroes of the Scottish Covenant appeared in 1832, and in 1856 he produced a partly autobiographical, partly fabulous, History of a Man. For thirty years he was engaged upon a long poem, on Night, which was published in 1867, but its theme was too vast, vague and unmanageable, and the result was a failure. He also edited an edition of the British Poets. As a lecturer and as a preacher he drew large crowds, but his literary reputation has not proved permanent. He died having just finished a new life of Burns designed to accompany a new edition of the works of that poet.